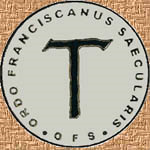 The Secular Franciscan Order, Ordo Franciscanus Saecularis (OFS) with some 400,000 professed members belongs to the global Franciscan Family and is "formed by the organic union of all the Catholic fraternities, whose members, moved by the Holy Spirit, commit themselves through profession to live the Gospel after the manner of St. Francis in their secular state following the Rule approved by the Church." (Const. 1,3). St. Joseph the Worker Fraternity, Trillium created this introductory video "Come and See". Read more about the The Rule of the Secular Franciscan Order. In the words of "The Rule of the Secular Franciscan Order, "The Franciscan family, as one among many spiritual families raised up by the Holy Spirit in the Church, unites all members of the people of God - laity, religious, and priests - who recognize that they are called to follow Christ in the footsteps of St. Francis of Assisi. In various ways and forms but in life-giving union with each other, they intend to make present the charism of their common Seraphic Father in the life and mission of the Church. The interpretation of the Rule and of the Constitutions belongs to the Holy See. The practical interpretation and harmonization of the Constitutions, is the responsibility of the General Chapter of the OFS. The clarification of specific points which require a timely decision is the competence of the Presidency of the International Council of the OFS. Sitting in Rome, the International Council of the OFS (CIOFS) has its own proper statutes approved by the General Chapter of the OFS and confirmed by the Union of the Franciscan Ministers General. represent Secular Franciscans, at the National level, in their associations with church or civil organizations and to promote mutual relationships with other such organizations where appropriate. implement the decisions of the Regional Chapter, Regional Council, National Chapter and the National Council. La Nouvelle Revue franciscaine propose un nouvel art de vie inspiré de Claire et de François d’Assise. Elle tente de rendre compte des grandes valeurs dont le mouvement franciscain est porteur : quête de Dieu, cheminement intérieur, simplicité de vie, protection de l’environnement, pratique de la justice, proximité des petits, non-violence active, dialogue entre les religions et les cultures.